Start a Graph starts a specified graph from a specified sandbox. Task type "Start a graph"
This select box contains sandboxes which are readable for the logged user. 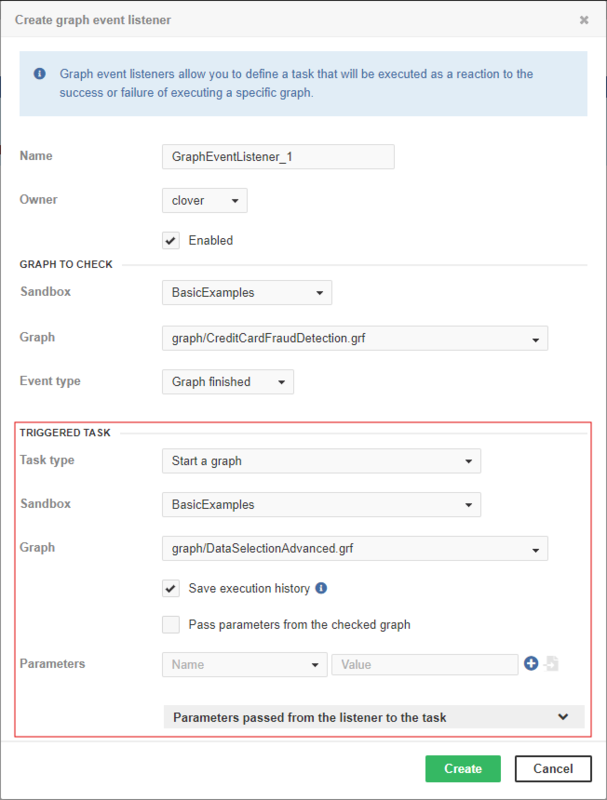 Select the sandbox which contains the graph to execute. The graph to be executed. This select box is filled with all graphs files accessible in the selected sandbox. Type a graph name or path to filter available items. Information about the execution of the graph is saved to database. Allows the user to pass parameters from the checked graph (jobflow) to the graph triggered by this event listener. A list of parameters passed to the graph. Please note that the behavior of this task type is almost the same as Start a Jobflow. You can start a graph with parameters. To start a graph with a parameter, choose an existing parameter from the list, set its value, and click the plus sign button at the end of line. If the graph is started by an event listener, it receives additional parameters from the triggering job. EVENT_RUN_JOB_FILE A sandbox-relative path to the graph/jobflow file. EVENT_RUN_RESULT The current status of the graph/jobflow execution (N_A, READY, RUNNING, WAITING, FINISHED_OK, ERROR, ABORTED, TIMEOUT or UNKNOWN). EVENT_RUN_ID A numeric ID of the run record representing graph/jobflow execution. EVENT_JOB_EVENT_TYPE A graph/jobflow event type that triggered the task.